It isn’t everyday I stumble upon a chicken coop that’s equally sleek, creative, and water wise. 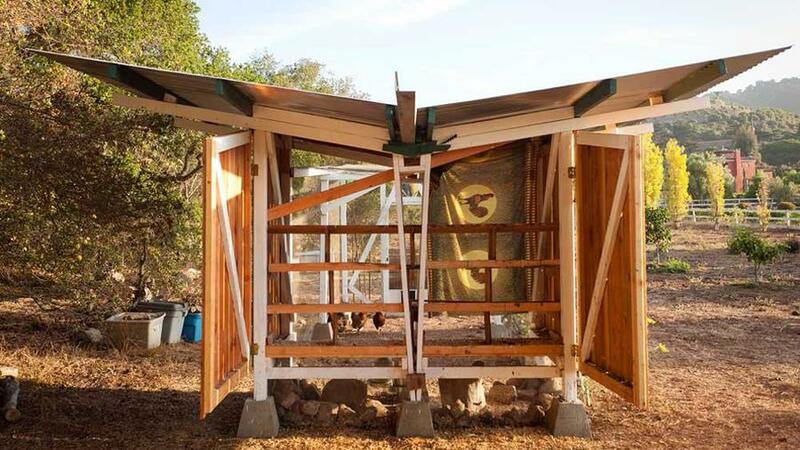 Eager to learn about this drought-friendly design, I chatted with Santa Barbara architect, Alex Wyndham, to get the full scoop on Toro Canyon’s Chicken House. Q: How long have you been making chicken coops?A: I made the Chicken House about a year and a half ago. I’m an architect, so I design houses for a living. I make a lot of sheds and buildings, but this was my first chicken coop. Q: How did you come up with the water wise design?A: The idea was that southern California is super dry and in a state of perpetual drought, so the roof made it easy to capture rainwater by funneling water into a barrel. That way it could catch water throughout the winter and summer for gardening since the clients had a big plot next to the coop. Q: How long did it take to build the chicken coop?A: Two to three weeks, but we worked on it sporadically–probably a total of four or five days all together. Q: How many chickens fit in the Chicken House?A: I went by the standard chicken guidelines, so it holds about 40 hens, but right now the clients only have 15-20. Q: What’s your favorite part of this design?A: I like that it opens up. The back consists of two solid doors, so the entire backside opens up, so you can reach in and get the chicken eggs instead of having little doors where you have to reach in. I also like that’s its anthropomorphic and it looks like a bird flying with birds living inside. It’s fun thinking about what a building should be like for an animal, especially because I’m used to designing building for people.